Financial service organizations are constantly grappling with ever-changing, ever-mounting regulatory obligations to supervise and archive all discoverable content. 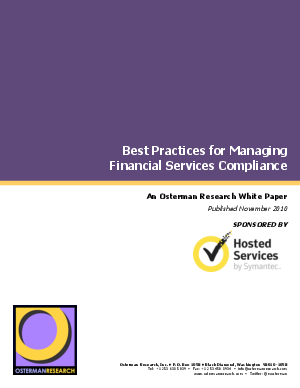 This white paper discusses the fundamentals of financial services compliance. It then puts forth a case for considering archiving and security as a unified decision, and proposes an archiving solution based on the SaaS model as a most effective means to meet supervisory and archiving obligations.